There really are three main categories of potential claims, including (1) personal injury claims of those who survived, such as burn injury victims, (2) property damage claims of those who lost their homes and possessions, and (3) wrongful death claims, on behalf of those who lost loved ones in these tragic fires. 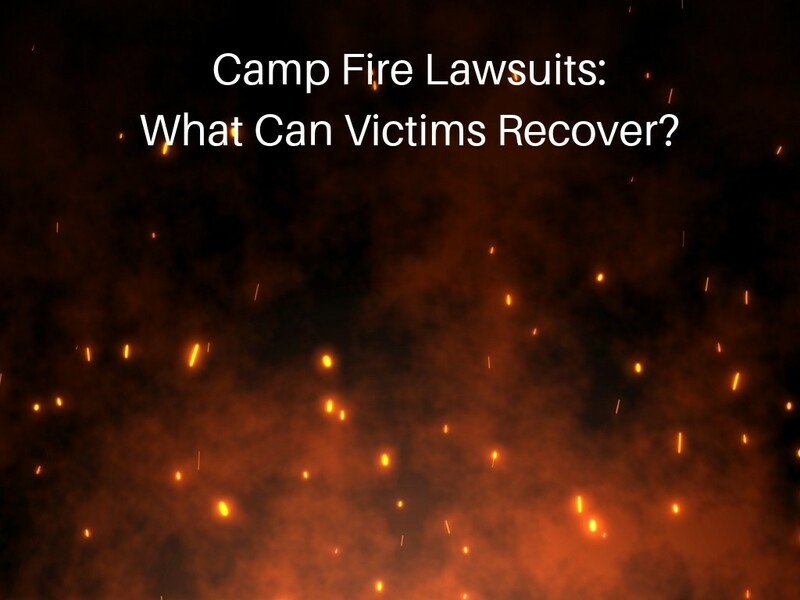 This article will focus on the potential recovery of the Camp Fire personal injury victims and the wrongful death claims of family members. There are an unknown number of people who suffered severe burns during the Camp Fire. Some of those people have reportedly received burn injury treatment from nearby hospitals. Burn injury treatments can be among the most painful medical treatments, depending on the severity of the burns. Burn victims may receive three categories of damages: (1) medical care related to the burns, including future medical; (2) lost wages caused by the fire; and (3) physical and emotional pain and suffering. (They may also have property damage claims, but those aren’t the focus of this article). Payment for medical bills is self-explanatory, and usually pretty straightforward. The bills are what they are. As for future medical, if the victim’s treating providers testify that the plaintiff will need future medical care, and give cost estimates, the plaintiff may recover money for those anticipated bills. The most unclear portion of the damages for any personal injury claim is always the value of pain and suffering. Generally speaking, the more invasive and serious the treatment, the higher the value of pain and suffering. There is no chart providing specific value for pain and suffering. Juries can give these claims any value they want. When cases settle before trial, pain and suffering is often some multiplier of medical bills. This multiplier can vary depending on the strength of the evidence of actual pain and suffering. To prove pain and suffering, photos of burn injuries can help. So victims should take photographic evidence of their treatment procedures, and burns, as they heal. The next type of claim would be filed on behalf of surviving family members, who lost loved ones during the fire. These are called wrongful death claims, and the damages can be substantial. Generally speaking, the amount of damages will largely be determined by the strength of the relationship between the surviving family member, and the deceased Camp Fire victim. Testimony from witnesses, photos, and other documents, can be used to prove this relationship. Wrongful death damages do not include the pain and suffering of the person who died. For example, in the Camp Fire wrongful death cases, testimony from witnesses regarding the likely suffering by burning in the fire, of the victims, will not be relevant. Even the plaintiff, who is the person filing the lawsuit, can’t recover for his or her grief or sorrow caused by the death. Most of these factors come down to the strength of the relationship between the person who died, and the loved one who survived. California wrongful death lawyers prove the strength of the relationship in many creative ways, all of which require extensive skill, planning and thought. Generally we will identify witnesses who knew both the decedent and the survivor, and who are willing to testify about their relationship. This might include people like teachers, friends, co-workers, or other family members. They may share stories that prove the love and support between them. We must spend a lot of time speaking with witnesses, and probing their memories, to develop the powerful testimony needed to achieve high damages in wrongful death cases. If available, we can also use photos, letters, cards, and video, which show the jury firsthand just how strong these relationships were. Some of the typical documentary evidence may be harder to find in the Camp Fire cases, because many of these documents may have been destroyed. But hopefully surviving family members have some of this evidence in other locations. 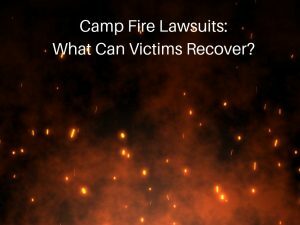 The age of the victims might also affect the value of the damages claims, since many of the Camp Fire victims were elderly. Life expectancy is part of the calculation in wrongful death cases. Read more about California wrongful death lawsuits. The potential damages might also be complicated by relatively limited insurance coverage. Although PG&E reportedly has $1.4 billion in available insurance, the damages are estimated at a staggering $10 billion, or more. How a judge or court might divide the available proceeds among victims is unclear. Additionally, if PG&E were to declare bankruptcy, that would further complicate these lawsuits. But the victims are still likely to recover a substantial amount from serious personal injury, or wrongful death claims. If you lost a family member in the Camp Fire, we can help guide you to the best California law firm to handle your case. Just contact us today.